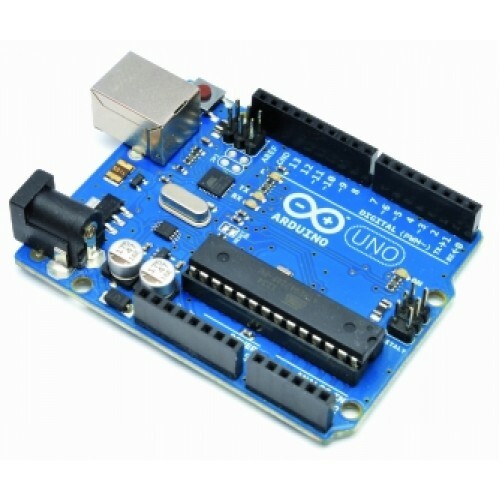 Arduino UNO R3- The new Arduino Uno R3 (third revision). Discount available! 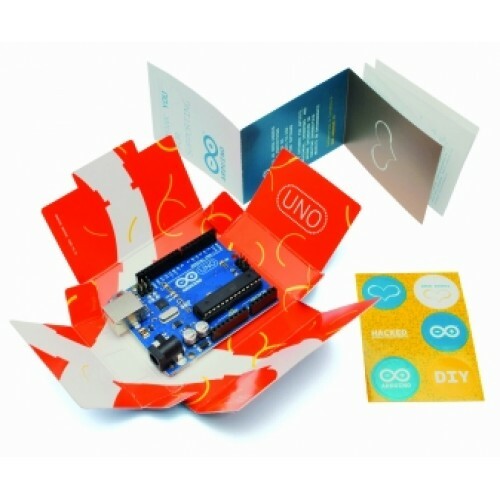 Recommend Arduino UNO R3 to your friends and get your Discount. The new Arduino Uno R3 (third revision). Uno now uses an ATmega16U2 to comunicate with the IDE. This allows for faster transfer rates and more memory and the ability to have the Uno show up as a keyboard, mouse, joystick, etc. Simple to make and with good stability (during movements, three legs remain always in .. It is a biped robot able to do complex movements. It has three joints (3 servos) for t..
Made specifically to be combined with an Arduino Uno allows you to read data from a ..
Shield equipped with a slot for a micro SD Card, ideal for applications that require large storage c..
Shield for Arduino based on the integrated LM1881 (National Semiconductors) which allows t.. This Ethernet Shield allows an Arduino board to connect to the internet. It is based on the Wiznet W.. 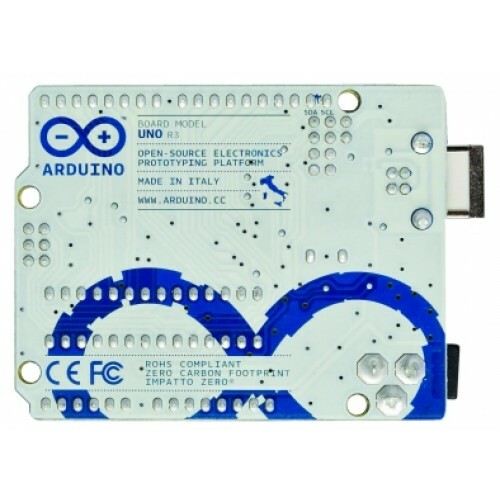 This shield for Arduino is part of a system for measuring and monitoring electricity consump.. 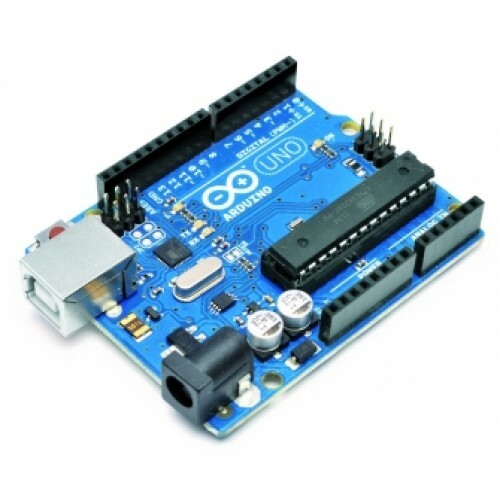 Since now on, it will be easy to provide your Arduino with Internet connectivity by using .. This shield allows you to control 6 devices through relay and acquire the status of 6 analog inputs ..
Shield based on the 555 timer configured as a monostable able to turn on and off Arduino at adjustab.. The board ISP & Serial Programmer is a powerful programming tool for all microcontroller ATMEL A.. Adding wired or wireless remote control to Arduino main boards become easy with this PS2 Shield toge..
Based on RX-4MHCS-4B of Aurel, an hybrid module containing a superheterodyne receiv..
1Sheeld is a new easily configured shield for Arduino. It is connected to a mobile ..
Based on the chip RF transceiver MRF24J40MA and compatible with the IEEE .. This shield, combined with the mainsail sheet allows you to create an infrared univ..
Based on MGC3130 Microchip chip and combined with ..
New shield Real Time Clock is applicable to an Ard..
Shield for Arduino that allows a complete electric..
Ring with Neopixel technology with 12 RGB L..
Ring with Neopixel technology with 16 RGB LED diodes which can be individually mana..
Ring with Neopixel technology with 24 RGB L..
Ring with Neopixel technology with 60 RGB L.. Combined with Arduino, raspberry or other microcontroller, this panel with 512LED R.. Combined with Arduino, Raspberry or other microcontroller, this panel features 1024.. Consisting of two boards, one with 18 and another with 14 terminals and reset button, it makes avail..
Shield for Arduino consists of a TFT LCD d.. It allows equipping the Arduino board with a GPS receiver module. Thanks to the lib.. Box in black ABS specifically designed to fit an Arduino UNO board, with the option to press the res.. Combined with Arduino, Raspberry or other microcontroller, this panel features LED RGB 2048 (64x32),.. Plastic packaging containing many electronic components to carry out experiments wi..
EasyRobot is a shield for Arduino-Fishino that allows to make a robot on wheels. Th.. This device has based on Ethernet chip Wiznet W5100 (datasheet) that allows you to .. This is a thermal printer like you would find on a cash register or adding mac..
Shield for 2.4 and 2.8 inch TFT displays with touch screen and SPI communication. I..
Transparent protective box in plastic acrylic suitable for housing Arduino Uno R3 .. This is a serial interface E-Ink display module, 4.3inch, 800×600 resolution,.. This is an E-Ink display HAT for Raspberry Pi, 7.5inch, 640x384 resolution, with em.. This is an E-Ink display module, 1.54inch, 200x200 resolution, with embedded contro.. This is an E-Ink display HAT for Raspberry Pi, 2.13inch, 250x122 resolution, with e.. This is an E-Ink display module, 2.9inch, 296x128 resolution, with embedded control..
AlphaBot is a robotic development p..
Small module based on two MOSFET connected in parallel that allows, by s..
Based on the 433 MHz RFM98W transceiver module; this shield for Arduino, Fish.. The LCD Keypad shield is developed for Arduin..
AlphaBot 2 is a robotic development platform that integrates a programmable Ar.. This set has composed of an electronic interface board and a 5 kg load cell mounted..
Based on GPS GPRS / GSM SIM808 module, this shield can be used with Arduino (UNO, L..
Shield for Arduino equipped with SD Card slot and micro SD adapter. It has a commun.. Kit containing everything you need to make a plexiglas robot arm with 4 degrees of ..
Servo shield for Arduino/Fishino UNO allow to control up to 6 RC servos 3 pins (+5V..
Electronic board based on the HX711 chip, a 24-bit analog-to-digital converter, spe..
Black plexiglass chassis cut to LASER with Futura Elettronica logo, its diameter (a..
Breakout with rotary encoder at 20 steps / 360 ° (18° for step). The o..